In the end of 2003 Silmido, a movie about South and North relationships, shook the South Korean box office, but not giving it even a few month of rest, another bomb was dropped upon South Korean viewers in early 2004, Tae Guk Gi: The Brotherhood of War (Taegukgi hwinalrimyeo), similarly themed film, directed by Je-kyu Kang of his Shiri fame, that beat all the prior set records. One third of South Korea population attended cinema to watch this film according to number of admissions. It's 1950, two brothers, Jin-seok Lee (Bin Won) and eldest Jin-tae Lee (Dong-gun Jang) are spending ordinary time in streets of Seoul, living together with their mother and fiance of Jin-tae - Young-shin Kim (Eun-ju Lee). Peaceful life ends when North invades, and family is forced to leave their homes. Due to some unlucky circumstances both brothers found themselves on a train that's heading towards the battlefield. Cruel realities of war now become part of them. Revisiting events set almost exactly 50 years in past, director managed to grab attention of Korean public with this epic war drama. 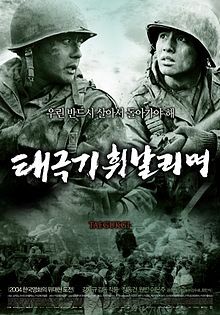 Often called Korean Saving Private Ryan, and not without a reason, they both share that gruesome depiction of war, cruelty served by both sides and magnitude in which the scale of the war is portrayed, be it special effects or actor performances. Even the visual styles of the movie are really similar. But most importantly they share similar, personal stories of the people involved. Comparable even in the way it is presented in the movie, starting with nowadays, showing survivors who share their memories and tell their stories, followed by dive in the past, where these memories are being replayed. Films original Korean titles contains the names of flags of both neighboring countries, as a symbolic gesture towards their once shared unity. Its should be mentioned that this movie is one of the final works of beautiful and talented actress Eun-ju Lee, who sadly committed suicide year after this film was released. Overall, a powerful and emotionally lasting war drama. Highly recommended.